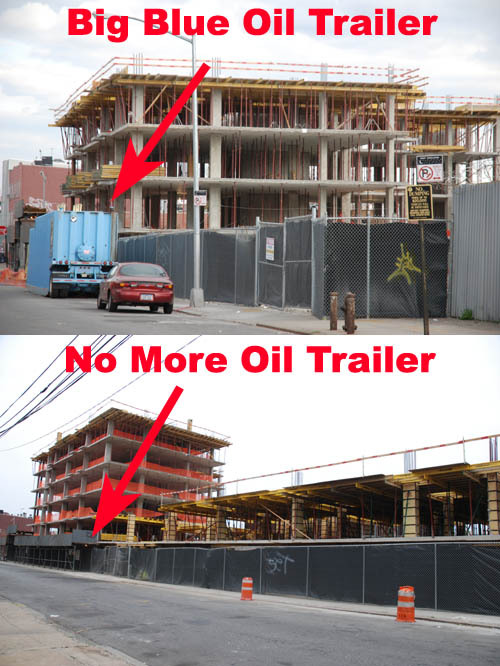 What we do know is this: No results from the many test wells drilled around N. 11th and Roebling that have become public or that have been passed on to public officials by the Department of Environmental Conservation. Consultants hired by the developer to do environmental monitoring of the site have reported that oil seems to be entering from the north and east although no one can determine the source of what they euphemistically, and without irony, call "free product." They also found what one would expect to find in the soil in the industrial part of Williamsburg: some arsenic, barium, cobalt, mercury, nickel, zinc and other things. (The contaminated soil was all removed, the consultants say.) There was measurable benzene in the groundwater too, but not a significant amount. We think it's worth noting that there doesn't appear to have been much in the way of intensive hands-on testing or monitoring by the Department of Environmental Conservation. Hey where's CBS 2 News, Geraldo, New York Magazine. Oh, their all too busy lying about Greenpoint to cover any issues in Williamsburg. Ixnay on the Prospect Park Pool Idea? The Most Depressing Red Hook Renderings. Ever.